Work zones are a necessary part of maintaining and upgrading our aging highway system. The combination of more work zones and heavier traffic volumes means work zones are having a greater effect on roadway systems. The American public has cited work zones as second only to poor traffic flow in causing dissatisfaction with the roadway system. Top improvements suggested include more durable paving materials, repairs made during non-rush hours, and reducing repair time. Unlike congestion caused by routine heavy traffic during daily peak travel periods, non-recurring events generally result in unexpected travel delays. Work zones account for nearly 24 percent of non-recurring congestion, or 482 million vehicle hours of delay. Work zones also have adverse impacts on traveler and worker safety. In 2002, work zone fatalities reached a high of 1,181. More than 40,000 people are injured in work zone-related crashes each year. Increasing amounts of funding are being spent on capital improvements and maintaining existing roads. In 2000, 54 percent of highway capital outlay was spent on system preservation. As vehicle travel continues to increase significantly faster than miles of roadway, work zones exacerbate the growing congestion problem. 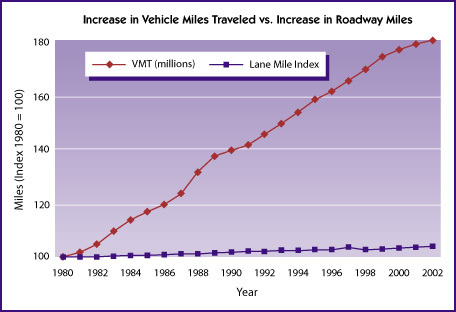 Between 1982 and 2002, route miles of highway increased 3.0 percent while vehicle miles of travel grew by 79 percent. Rush "hour" is no longer an hour. Between 1982 and 2002, it increased from 3-4 hours to 6-7 hours. The window to work without severely affecting traffic is getting smaller. In short, the trend is more work under heavy traffic conditions. Data from selected State department of transportation Web sites shows that 20 percent of the National Highway System is under construction in the summer and about seven percent during the winter months. It is estimated that over 6,400 work zones are in effect during the summer months, with a corresponding drop in capacity of over 6,100 lane-miles of freeway. Work zones in the winter are about half of those in the summer. Increasingly high traffic volumes on many highways make it difficult to perform work operations in or near travel lanes during much of the day because of the traffic flow and the risk introduced for workers and the traveling public. As a result, highway work is increasingly scheduled for off-peak periods. About one-third of work zones are active primarily at night. A review of State road closure and construction Web sites reveals that project location, purpose, and overall duration are likely to be posted early in the planning process, but the posting is unlikely to be updated. Information of greatest interest to the traveling public, such as number of lanes closed, times of closure, and estimated delay, is only reported between 7 and 22 percent of the time. The Federal Highway Administration (FHWA) has defined congestion mitigation and safety as one of its priority areas for attention and near-term action. Aggressively anticipating and mitigating congestion caused by highway work zones is one area that can have a positive impact on relieving congestion. Real solutions come from fundamental changes in the way projects are planned, estimated, designed, bid, and finally, constructed. A comprehensive approach to work zone management supports FHWA's Office of Operations' vision of "21st Century Operations using 21st Century Technologies" by proactively minimizing work zone impacts, serving the customer 24/7, and making use of real-time information. The Office of Operations is championing three major shifts in the approach to work zones using the 21st century philosophy. If implemented, these changes can reduce congestion and crashes in and around work zones. 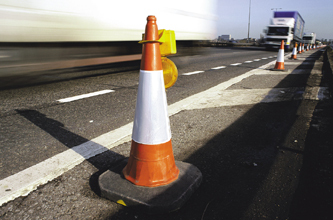 Work zone policies are necessary to support systematic consideration of work zone impacts across all stages of project development and address the safety and mobility needs of road users, workers, and other affected parties. FHWA developed a work zone self-assessment tool used by each State in 2003 to establish a baseline of their current state-of-practice and identify future work zone quality improvement efforts. Work zone safety and mobility assessment is necessary to understand the type, severity, and extent of impacts associated with different project alternatives. Strategies such as full closure, Intelligent Transportation Systems (ITS), public information and outreach, and incident management can be incorporated in project design, construction, transportation management and operations, and traffic control plans. FHWA developed "QuickZone," a work zone impact analysis tool. It estimates costs for both an average day of work and for the whole life cycle of construction, and can help the user determine what times of day and time of the year are best for a certain project. Transportation management plans (TMP) take into consideration all elements of traffic management necessary to improve safety and mobility during the course of a road project. Typical elements of a TMP would include a traffic control plan (TCP), operational and demand management strategies, and public information and outreach strategies. The degree and complexity of these elements in the TMP would depend on the severity of the safety and mobility impacts on the traveling public and the safety of road workers. FHWA promotes using ITS technologies in and around work zones to mitigate impacts of work zones. FHWA published the ITS and Work Zone Case Study that discusses the application, benefits, and lessons learned of ITS in work zones in four locations. FHWA findings show the use of full road closure during rehabilitation can reduce both work zone congestion and crashes. In these projects, the roadway is closed, traffic re-routed, and the contractor given full access to the roadway with the expectation that construction time will be dramatically reduced. Note: In September 2004 FHWA updated the Work Zone Safety and Mobility Rule (23 CFR 630 Subpart J). Through this updated Rule, the Office of Operations is working to bring about these major shifts in the approach to work zones. The updated Rule requires that State and local governments develop a comprehensive work zone policy and TMPs for all Federal-aid highway projects, and encourages agencies to conduct work zone impacts assessment to better plan for and manage work zone impacts. The Work Zone Best Practices Guidebook shares highway community success stories and lessons learned with practitioners including policy and procedures, public outreach, contracting, construction methods, enforcement, and ITS. 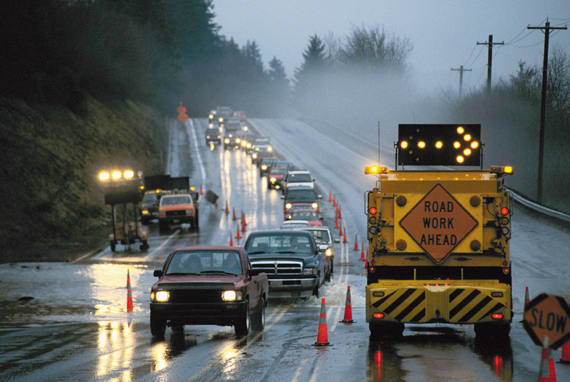 FHWA, with State and local partners, is sponsoring "Making Work Zones Work Better" workshops to share information on new and emerging technologies and practices focused on reducing congestion and crashes associated with work zones. FHWA is committed to reducing congestion and crashes in and around work zones. We continue to work with State and local governments, other Federal agencies, transportation officials, partner organizations, contractors, and others to improve work zone safety and mobility.